After Newsletter Sign-Up has been downloaded well over 50.000 times I have gotten quite some questions on how to properly configure the plugin. No wonder, the plugin is not that easy to configure for the less tech savvy WordPress users. With this guide I am trying to make things a little easier. You can download and install the Newsletter Sign-Up plugin just like you would install any other WordPress plugin. Search for Newsletter Sign-Up in the plugin repository. Install right away or download the ZIP file and upload the contents of it to your /wp-content/plugins/ folder. Not familiar with installing WordPress plugins? The WordPress codex has a helpful article on installing plugins that might help. Clicking the settings link will take you to the settings page for the plugin. The most important configuration settings are located on the general settings screen. These settings are essential if you want to get Newsletter Sign-Up to work with your newsletter service. If your newsletter service is included in the dropdown box, selecting it will prefill some fields for you. You could however just leave the select box at other / advanced and provide all the necessary values yourself. If you’re using MailChimp or YMLP then you have the option to use their API, which I recommend. Let’s start with those two. Update June 2013: I suggest using my MailChimp for WordPress plugin to add sign-up methods for your MailChimp lists to WordPress. It’s free and a lot easier to use. 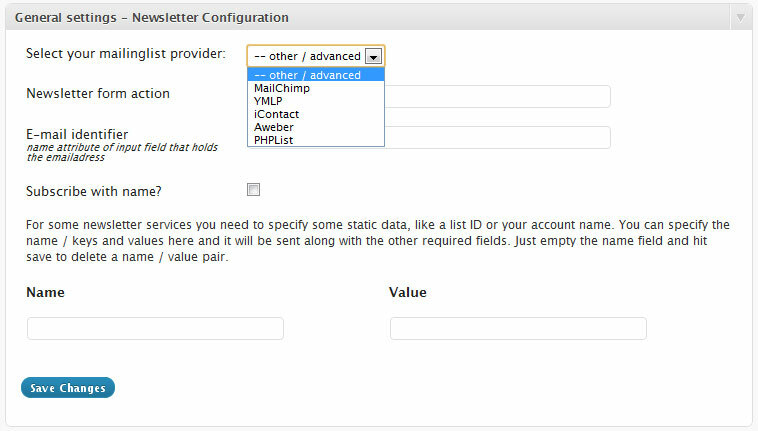 Selecting MailChimp from the mailinglist provider dropdown and tick the checkbox that says Use MailChimp API? Fill in your API key and MailChimp list ID. If you’re not sure where to find these, click the ?-link. Select YMLP from the newsletter provider dropdown and tick the checkbox that says Use YMLP API?. Fill in your YMLP username and API key, which you can find by clicking the ?-link. To find your YMLP group ID, go to your YMLP dashboard and take a look at the “Your Contacts” screen. Hover the icon for the list you want to use and take note of the URL which includes your groupid. If you’re using iContact, Aweber, ConstantContact or GetResponse then this is your section. Configuring Newsletter Sign-Up for those services is a little harder but definitely not impossible. Get your form embed code Head over to your newsletter service and look for a sign-up form to embed. We need this piece of HTML to extract the required configuration values. Go to Newsletter Sign-Up > Config Extractor and paste your form embed code. The plugin will automatically try to extract the correct configuration values for you. In some cases this will fail though. No worries, you can still manually extract the various settings. The form action is the action attribute of the form element. This tells Newsletter Sign-Up where to send the subscription request to. The email identifier is the name attribute of the input field that holds the email address. The name identifier is the name attribute of the input field that holds the name. Additional data can be anything in key / value pairs. Provide any other fields you find in the embed form as additional data, using the value of the name attribute as the key. Testing to see if you properly configured Newsletter Sign-Up is pretty straightforward. Include the form on any of your page using the [nsu_form] shortcode and submit it to see if it works. Make sure to use an email address that is not already on your list as most newsletter services will silently ignore those. Also, have at least a few minutes of patience and make sure to check your SPAM folder for an email confirmation. Still not getting it? Try this. Drop me a line trough the support forums for Newsletter Sign-Up, include your sign-up form and me or someone else will extract the correct values as soon as we find a spare minute!